It’s been a while. But rather than give excuses, let’s just get to it then, shall we? Everyone’s family has traditions, especially around the holidays. 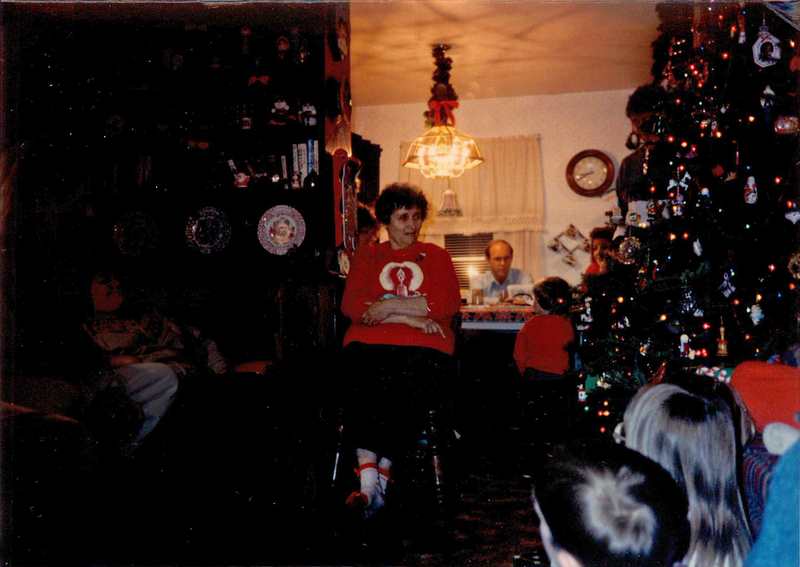 For my family, one of those traditions was the telling of the story of Meriweather the Elf. Ages ago, my mother had typed up the story and even submitted it to a magazine or two, but it never got anywhere. The gist of the story is that Santa has a helper, a special elf named Meriweather who keeps watch and helps Santa know who’s been naughty or nice. Sound familiar? Yes, like that creepy Elf on the Shelf. Only, a heartwarming family tradition. Until the Shelfish guy hit big-box bookstores everywhere. For years. YEARS. I’m talking, from the time I first decided to actually make the story into a book and sketched the first version of Meriweather, to the time the freshly inked pages reached my doorstep, was a little over 9 YEARS. It’s a wonder we’ve ever completed a DIY project to share with you here. So yes, for years I had been kicking the idea around of creating a book from the original manuscript my Mother had copied for me. 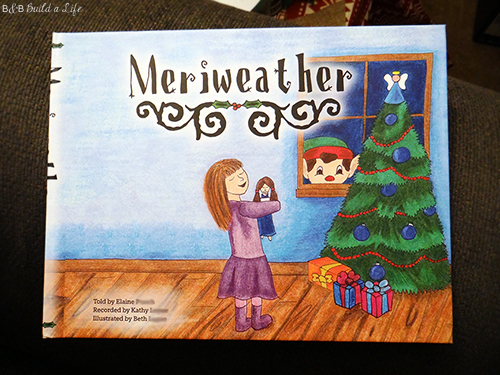 I had an idea of what I wanted Meriweather to look like, and had gotten as far as creating a really rough draft version of the book that my Sister helped print right before Christmas one year. But with only about half the drawings completed, it just wasn’t going to cut the ‘family heirloom’ quality I had in mind. Fast forward to my trip to Europe with my best friends that I shared with you last year. A trip like that? You’re going to take a lot of pictures. So naturally I wanted a way to enjoy them outside of Facebook. Enter Shutterfly into the equation. I created a fantastic photobook with all my favorite images from the trip, and even added a handy pocket to the inside cover for ticket stubs and other scraps of the trip. It worked out so well, I got to thinking — what if I just use full-page sized images to create the book? So I got to drawing the rest of the illustrations needed for the story to be fully told! My preferred method of illustration for this project was with ink for the line drawings followed by pigment from my favorite, Prisma colored pencils, smoothed with the blender pencil. Then I scanned the images in and cleaned them up a bit, and decided on my basic layout. I chose to do an 8×11 size book, and Shutterfly even has handy guides and details for digital scrapbooking that worked great for this project, so I knew exactly the dimensions, resolution, and color codes to use. I had intended to finish the book in time for Christmas last year to give to my Mother, Aunt and Sister, and I had finished with only 3 days left within the guaranteed-by-christmas deadline. Having had an excellent experience before with their customer service, I decided to just make the jump and ordered 4 books at once and hoped they’d come out well. The day my happy orange package arrived, I was THRILLED. I tore it open and breathed in that freshly-inked scent, and then nervously opened the perfectly sealed copy I ordered for myself. And it was Fantastic! The pages printed perfectly, the text layed out just as I had painstakingly planned it. And it arrived just in time to be wrapped and brought home for the holiday. And I could actually say that I had been [self] PUBLISHED. Really, the only thing I’d have changed, was the spine of the book itself. The template called for a fairly wide design, and I assumed that meant that’s how wide it would print, but it also accounted for the wrap around the edges to the cover. So on the front cover, you actually see a bit of the edging from the title down the spine wrapping around. Not a big deal really though. So there you have it, I am now a published illustrator. Have you ever had an idea for a book? It turned out beautifully!! Brought tears to my eyes and was hands down the best Christmas present our family received! My mother and I have always dreamed of writing and illustrating our own children’s book. From your post I can see that our dream is not so far fetched after all. Thanks for sharing!